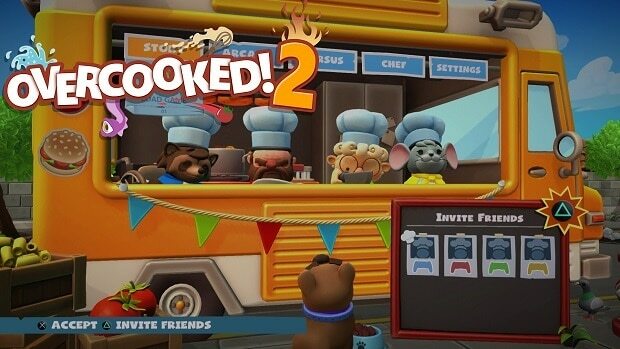 The sequel to the popular cooperative-chef-simulator game is here and we will be dissecting the basic concepts and mechanics that go into play to better help you. Get ready to chop up some vegetables, mix in some sauces, and stir the whole mixture with our Overcooked 2 Beginners Guide. The more popular mode, the multiplayer, is the real reason the game is so well known. Although the game will keep throwing hard dish recipes for you to tackle, you will need all the cooperation and communication you can between your friends or whomever you are playing with. Time management is extremely crucial since you want to proceed with the utmost caution and urgency. Keep your friends updated about anything that is going on in the kitchen. You also need to go through the layout of the whole level before you actually start playing it. This will give you an idea of the geography of the whole area so you can head to the desired location without having second thoughts. Once you have kept in mind locations for where the ingredients lie and where each player is supposed to work, the effectiveness goes up, and the time wasted goes down. Even if you have got used to some of the levels, there will be challenging ones later on with added dynamism like moving platforms and more hindrance. Here, it is essential that you make use of the Throw feature be it a dish passing it to one of your friends closer to the desired location or simply launching an ingredient directly into the pan. Also, use the Dash feature to cover more ground quickly and beat the environmental challenges within that level. It is not all about preparing food though, make note of that. Without the plates to keep those eateries on, there is no way you can bring it to the customers. That is why it is essential that you take out time to clean the dirty plates over at the sink in order for them to be reused. This also helps you maintain a decent tip-multiplier. Finally, it is not all about complicated dishes which take a lot of time and effort just to prepare. If you are running low on time, maybe look out for any simple dishes that you have got pending on your list. Prepare and send them out first, you do not want to lose points that are just sitting there now, do you? While you may get overwhelmed by the number of orders you receive, you should know that the expectations of you going into this mode are lower than that of the Multiplayer Mode. For single player, you can control multiple characters so everything goes just as you planned it without any intervention from an incompetent AI partner. Therefore, if you have made one character in charge of chopping up veggies, you can proceed to do some other tasks like mixing ingredients, etc. Moreover, small tasks like boiling or frying would not require attention from the chef at all times, as once it will start, it will continue to proceed automatically. Since there were many minds working on a single recipe in the Multiplayer Mode, it can be particularly tough to memorize everything when it comes to just you handling everything. This is why you need to spend more of your time on reading the cookbooks and memorizing, at first, simple recipes and then taking it from there. Do not take it too hard on yourself; there is no need to memorize a difficult dish if you do not have the confidence of succeeding with it. Start smaller and simpler, and in time, you will get the upper hand on it to advance to more expert dishes. Multitasking remains important here as well as for the tougher dishes like sushi, you will need different chefs assigned for different tasks to save up space and time. Each chef can be given multiple tasks as well to accelerate the process even further e.g. a staff member working on the conveyor belt may not have the moving space to go all the way over to the sink and clean dishes. However, a chef boiling water may be closer to that sink and can do the dishes. Lastly, keep replaying levels to get a better understanding and thus a better score in it. Playing it for a decent amount of time will eventually lead you to sharpen your skills, gaining momentum and learning a whole lot of recipes. Each game from here on gets you better results. This is all we have in our Overcooked 2 Beginners Guide. If there is anything else that you would like to add, let us know in the comments section below!